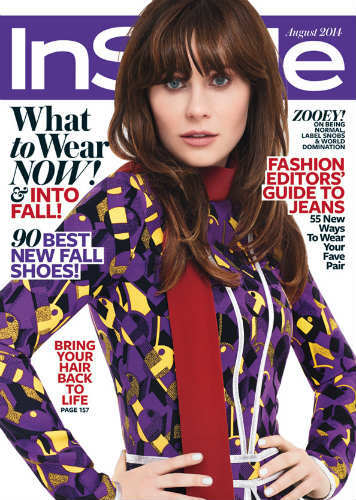 -InStyle claims this is Zooey Deschanel on their latest cover, but I’m not convinced. Anna Friel, Evangeline Lilly or Jared Leto? Maybe. But that’s not the New Girl. –Britney Spears posted a photo with her boyfriend amid rumours that they broke up. Who needs official denials when there’s Instagram? -Of course, if you’re Mya and everyone thinks you cheated with Jay Z, an official statement is still the way to go. –Hilary Duff and her husband saw Jonah Hill on the street and tried to say hi, but he was having none of it. –Madonna teased her new track “Messiah” with a quickie Insta-vid. So many strings. –John Mayer reportedly wants to produce a reality show with Anthony Bourdain, who already has an amazing reality show that isn’t contaminated by douche stank. –Megan Fox just joined Instagram, but she already has the duckface down. –Taylor Swift and Jaime King are spending their long weekend playing in pools and baking cakes. I’m sure they’ll work in some needlepoint and vintage bowtie shopping somewhere in there, too. –Penn Badgley is dating Jemima Kirke’s sister. What’s weirder: that I’m still bummed he broke up with Zoe Kravitz, or that I think he’s really making that tank top work? -Breaking Bad’s Dean Norris just can’t stop complaining about his acting gigs. Go stare at your minerals, Hank! –Zac Efron eats a bug and Ben Stiller hangs off the side of a helicopter in the preview for the new season of Running Wild With Bear Grylls. –Robin Thicke says of his attempts to woo Paula Patton: “I actually have no idea what I’m doing.” Yeah, we can see that. -Maleficent keeps quietly killing it: it crossed $600 million at the worldwide box office. -I kind of like that Buffy’s Cordelia and Darla still hang out. –Lucy Hale described how awkward it was to audition for Fifty Shades of Grey — and then kind of played it off like she turned it down. SURE she did. -How did so many not-terrible actors end up in Selena Gomez’s terrible-looking new movie? -Here are some new clips from I Origins starring Michael Pitt and Brit Marling, which Sundance went crazy for. -Here’s the first trailer for Before I Go To Sleep, starring Nicole Kidman and Colin Firth. I read that book on a plane once and it freaked be the crap out.